It’s a big step when your little one moves from the security and comfort of a crib to their first ‘proper’ bed. That’s why we have created this guide to help parents find the ideal toddler bed. We’ve reviewed a selection of beds which are safe, practical and are sure to look great in your toddler’s bedroom. You’ll also find some handy FAQs and tips to help ensure you are choosing the right bed for your child, at the right time. First, let’s take a look at some of the things to consider when shopping for a new bed for your little one. 3.0.1 When Should My Child Change to a Toddler Bed? 3.0.2 What are the Different Styles Available? Materials: There are different types of materials used to make beds, each offering its own advantages and drawbacks. Wood is a popular choice thanks to it’s durability and stylish appearance. It is also a sturdy material which is great – your toddler will probably want to test out their new bed by bouncing on it! Plastic is also common, particularly when it comes to character beds. It’s easily cleaned with a damp cloth which is ideal when toddlers are around! However, it might not be as durable as wood, and will usually only match one particular theme, unlike wood which never looks out of place. Safety: All toddler beds come with guard rails of some sort. Some offer rails only at the head end, whilst others have rails around the whole bed with just a small opening to climb in and out. Some have slatted rails whilst others have solid panels. Smaller rails are sufficient in many cases, however if you are unsure it’s better to go with longer rails for peace of mind. These are useful if your toddler is very active during the night. Ensure the bed you choose meets current required safety standards. Also check materials are non-toxic and that there are no small parts which may prove dangerous for young children. Similarly, ensure there are no screws or bolts sticking out which could cause injury, and all edges must be smooth or rounded. Size: Toddler beds are the same size as cribs, generally speaking. However, some can adjust to different dimensions, expanding the lifespan of the bed. Certain models can be expanded to a twin sized bed, and you can even find cribs which adjust all the way to adult beds. This can help save money in the long run, and will ensure the bed sees more than a few years of use. Check the size to ensure you get the correct sized mattress to accompany the new bed. Budget: Toddler beds come at a variety of price points, so it’s important to determine how much you have available to spend. Be sure to budget for the mattress too, if you will be choosing a new one. Be prepared to spend a little more if you are looking for a bed which converts to other sizes. In general, character beds are on the cheaper end of the scale, and high-quality wooden beds tend to cost a bit more. This white toddler bed has a timeless, classic look so it will look great in any toddler’s bedroom. It is made from solid wood for durability and the headboard is soft polyester for comfort. The bed is designed to fit toddlers between the ages of 2 – 5 years old, so it will give a few years of use before your child will need to upgrade. A standard crib mattress will fit this bed, so there’s no need to purchase a new one. The guard rails on this bed extend around halfway down either side of the bed, so it’s ideal for most types of sleeper. The rails are unable to be removed when your child grows, as they help support the headboard. Assembly is relatively straightforward and can be done by one person in less than an hour. 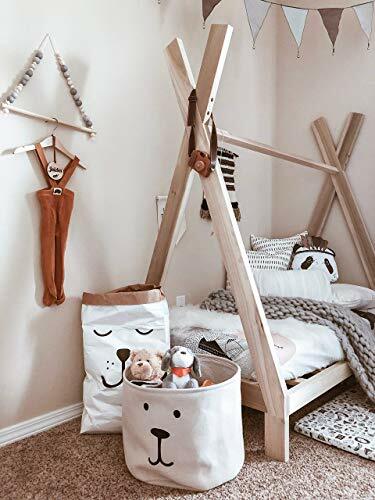 This toddler bed frame is shaped like a teepee, and would look great in a neutral-themed room. The frame can be customized by hanging decorations from the ends, and it is sure to make bedtime somewhat more fun! There are optional legs, so the bed can either rest on the floor or be raised by around 6 inches. No side rails are included with this bed, however it is very low so there is little risk of injury should your child roll during the night. The teepee bed is made from local poplar wood, which is knot-free and comes pre-sanded and with rounded corners. Assembly is easy – 5 step instructions are included and the wood is pre-drilled. You’ll also find all the necessary screws are included – all you need is a drill and perhaps someone to help hold the pieces. A crib mattress will fit this bed frame just fine. This toddler loft bed is ideal for older toddlers – due to the height it is not ideal for very young children. It’s made from metal for maximum strength and durability – it can support up to 200 pounds. This bed is also slightly larger – it required a twin mattress rather than a crib one, and the maximum depth of the mattress is 6 inches. A loft bed is ideal for rooms which are short on storage space. This model offers 29 inches of clearance underneath, so it can easily fit some storage boxes, shelves or drawers. Youngsters will also love having somewhere to sit under their bed – you can create a ‘den’ for them to play and relax in! Of course, kids will also love playing on the slide, it’s a great way to wake up in the morning! This is possibly the best bed for 4 year old children and above. This is possibly the best toddler bed for 2 year old girls and boys. It has a classic look which won’t go out of style anytime soon, and will match any style of decor or color scheme. However, white is not the only option – there are actually 15 colors to choose from. These range from natural wood or grey to bright pink, lime green and sky blue! There is something to suit everyone here. 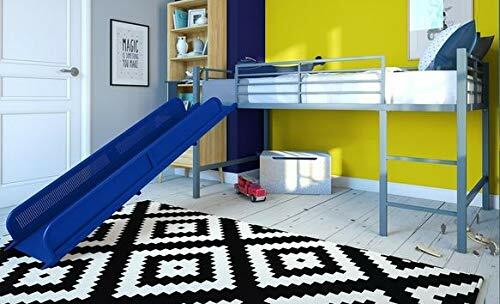 There are safety rails on either side, and the bed is low to the ground to prevent injury if a child does fall out by accident. Assembly is straightforward, with all necessary tools included. Standard crib mattresses will fit this bed, the Dream on Me mattress is recommended if you are looking for a perfect fit. This bed meets current safety standards and is free from harmful substances such as lead and BPA. The bed weighs only 16 pounds, yet can safely hold children up to 50 pounds. 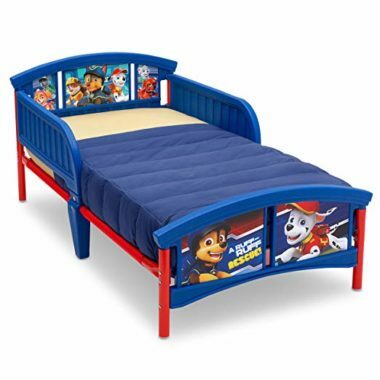 This Paw Patrol bed is simply perfect for a young fan of the popular TV show. It includes all their favorite characters, so it’s sure to make bedtime more fun. It’s ideal for creating a themed bedroom – you can easily find Paw Patrol toddler bed sets, curtains and more to complete the look. This bed is suitable from 15 months and above, and can hold kids up to 50 pounds in weight. 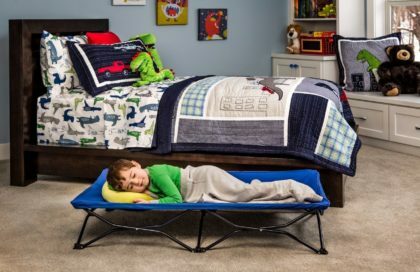 This is one of the best toddler beds for boys as it is easy to assemble and meets current standards for safety as laid out by the CPSC and ASTM. A combination of steel and plastic is used in the construction of this bed for durability. There are attached guard rails on either side, and the bed takes a crib-sized mattress. If your son is a Paw Patrol fan, this is definitely the ideal choice! 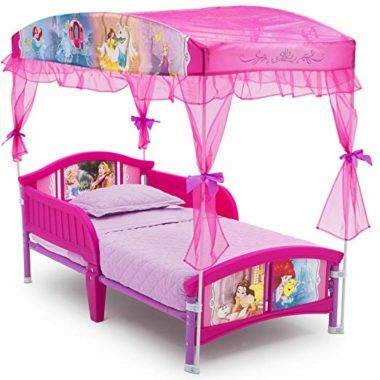 This princess toddler bed is ideal for girly girls who love all things pink! It comes with an adorable canopy, which gives the bed a grown-up feel and makes it a place your daughter will love to spend time. It’s also available in a Disney Frozen design which will be popular with toddler girls too. A mattress can be added to the bundle if required. The bed is rated to hold up to 50 pound, and is ideal for toddlers aged 15 months plus. Coordinating bedding is available separately to give your daughter’s bedroom a full Disney Princess makeover! The bed is just six inches from the floor, although the guardrails will help prevent toddlers from falling out of bed during the night. This bed is slightly more difficult to assemble than some of the other options reviewed here, however with a little time and help the end results are worth it! There are some great toddler beds for girls out there, but we love this one because of the cute design and sturdy construction. 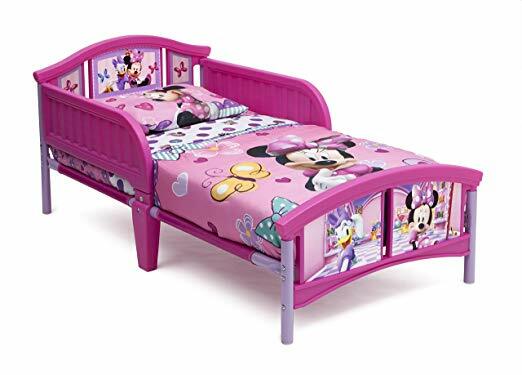 This Minnie Mouse toddler bed is simply perfect for little girls who love the popular Disney character. There is a whole range of coordinating furniture, bed sets and accessories available, so it’s perfect for creating a themed room. Similar to the character beds above, this one is for toddlers over 15 months and weighing under 50 pounds. It has smoothed edges, notable on the guard rails so parents can rest easy knowing their child is not at risk of injury. A toddler mattress is not included with this bed, however you can reuse the one from your child’s crib if it remains in good condition. The bed is made by Delta Children, which is a well-known manufacturer parents can trust. Assembly is easy, and the stickers also have to be applied as part of the assembly process. The bed is close to the floor, allowing toddlers the independence to climb in and out by themselves. This toddler travel bed is perfect for just about any occasion, whether it’s a camping trip, vacation or a trip to visit friends or family. It is very lightweight making it ideal even when flying or backpacking. There is a pump included to quickly inflate the bed with minimum effort. In fact, it can inflate in under 30 seconds! The bed is almost puncture-resistant thanks to the 40% thicker vinyl. This is the best toddler travel bed for those who are too big for a travel crib but not yet ready for an adult bed. It has plenty room inside – measuring 62 inches long and 38 inches wide. The side rails go around the entire bed, and they are 25% higher than those of other similar models, for added safety. A crib sheet will fit the mattress, so you don’t have to worry about finding something the right size. Alternatively, if you are traveling light, the flocked cover is comfortable enough to sleep on anyway. 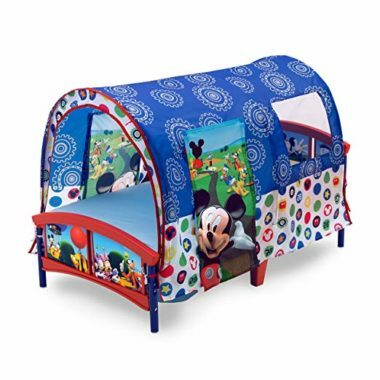 This is the best bed for 3 year old who loves Mickey and Disney! It comes with a tent which fully encloses the bed, creating a comfortable and cozy den for your toddler. There is a window to allow air to flow through, and also a door flap for easy entry and exit. Toddlers over 15 months old can safely use this bed, and it can hold up to 50 pounds so it will last for many years. The toddler bed mattress doesn’t come with the bed, however parents can simply use a crib mattress as the dimensions are the same. The bed comes with a steel frame which is sturdy yet easy to assemble, and the head and foot boards are made from thick plastic. The tent can be removed if no longer required or if your toddler simply fancies a change. Other character designs are also available if Mickey is not your child’s favorite. This is the best portable toddler bed for sleepovers when visiting friends and family. It can hold up to 75 pounds, yet it is lightweight and folds up easily. There is a fitted sheet included on the canvas sleeping surface, so there’s no need to worry about finding the correct size of sheet. The bed comes in three different colors – pink, blue or grey. The bed measures 48″ long, 24″ wide and 9″ high when fully set up. When stored, it measures just 9″ long, 8″ wide and 24″ high. 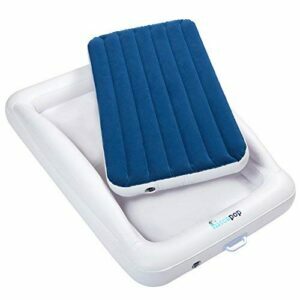 The bed can be used when camping or even for relaxing at the beach or in the park – it has loads of potential uses! Children aged between 2 – 5 years old can use this bed, so it’s ideal for when they have outgrown a travel crib but are not yet ready to sleep in a twin bed when visiting others. The bed is easy to clean and easy to set up – perfect for when traveling! The first on our list, the Orbelle bed, stands out thanks to it’s fine quality and stylish appearance. It has good guard rails which will prevent falls in the night, and is made from top-quality wood for maximum durability. Parents will love the chic and stylish appearance as well as the neutral colors – it will make your child’s bedroom look comfortable and classy! We have reviewed many cheap toddler beds which won’t break the bank but Dream On Me’s offering is the one which stands out. It is made from quality materials and has a classic look meaning it will go well in any child’s bedroom. It also has excellent safety features and ratings, as well as a coordinating mattress. For these reasons, we recommend this bed to parents who are on a budget. When Should My Child Change to a Toddler Bed? There is no strong answer to this question, and it really depends on when the child is ready to transition from their crib. Some toddlers skip the toddler bed stage and will go straight from a crib to a twin. In this case, many parents will choose to use a toddler side rail attached to the bed to prevent their little one from rolling out during the night. Most parents choose to move their child from a crib between the ages of 18 months – 3 years old, although some transition earlier and others later. There is no right or wrong answer, it depends on the individual child. If your child is often climbing out of their crib during the night, or trying to, it is safer to transition to a toddler bed. Similarly, if you would prefer your toddler to play in their room before wakening you, a toddler bed will allow them the freedom to get up and play in the morning. If a baby sibling is on the way, it’s a good idea to transition the older child to a new bed to allow the baby to use the crib. Be sure to leave plenty of time for the child to adapt to their new sleeping arrangements before the birth, so they don’t feel put out by the new arrival. Night-time potty training can be a good time to get a new bed too – it allows kids to go to the potty by themselves through the night once they reach this stage. What are the Different Styles Available? As you can see, there is a lot of choice, so it’s important to carefully consider which style is right for your family prior to making a purchase.